We like to reward our members.... Help us help you, by helping us! Now travel with Arrive Relax and ArriveRelax.com is even more rewarding. Everyone loves to save a little money or get something for nothing. Here at Arrive Relax, we wanted to do things just a little different to say thank you for your loyalty. You, our customers have been asking for some form of loyalty scheme and so we decided to investigate. Of course, we all like loyalty cards but it’s a real pain carrying them around so we came up with a very simple solution, don’t carry them. That’s right our loyalty club is simply run by your name and membership number. No card to carry, all the rewards, simple. Arrive Relax has spent some time working with some of our suppliers to develop what we believe is the best little travel loyalty club around. We worked hard to find a solution that didn’t require lots of new ‘printed’ cards (raising the costs to our members – oh no! ), our customers wanted a scheme that was ready to go and required very little work (and effort) from them but one that could be accessed with ease, one with a human face, our travel designers. 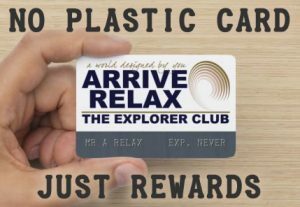 So here we are ‘The Explorer Club’, an easy to use reward scheme tailored to our customers and FREE to everyone right now. WHICH BOOKINGS CAN I EARN MILES ON? We are introducing rewards on a wide variety of suppliers booked through Arrive Relax. Your ‘travel designer’ will tell you if you are entitled to earn rewards on your booking (chances are that you can there are 100s of suppliers). Nearly all bookings made via Arrive Relax and ArriveRelax.com are eligible. We offer a number of bonus miles as part of the Arrive Relax ‘Explorer Club’, some you will see when you move around the ArriveRelax.com website. Others are credited by our team to simply say thank you for helping us. – For every confirmed booking that is referred to us via your membership – 1000 Bonus Miles. – Each new member who joins Arrive Relax ‘The Explorer Club’ via your membership – 500 Bonus Miles. For every £1 you spend with us we will give you 1 point, each point is then redeemable against future bookings**. It really is that simple. There are no blackout dates, the only restriction is that you can only redeem points against a booking with a minimum value of £1000. Points can be redeemed in blocks of 2000 (Every time you call us, tell your ‘travel designer’ that you are a member and they will ensure that your points are allocated to your account). Don’t worry if you can’t remember your membership number, your ‘travel designer’ can find that very easily. In the first instance, contact your ‘travel designer’ and talk through your plans. Advise them that you would like to use ‘Explorer Miles’ on your booking. They will confirm how many miles that you have available. You can then redeem them in blocks of 2000 (each mile is worth 0.0025). Your ‘travel designer’ will then deduct the value from your booking. Please note that to comply with industry regulations your booking will still be issued at the full value. ** redeemable against bookings that are departing at least 30 days from the arrival of the credited booking.